Sesderma Hidraven Cream is suitable for all skin types, especially delicate and sensitive, acne-prone as well. It is a perfect solution for skin which tolerates soap badly. Sesderma Hidraven Cream is suitable for all skin types, especially delicate and sensitive, acne-prone as well. It is a perfect solution for skin which tolerates soap badly. Cream is recommended for quick and easy make-up removal of the face and eye area. Because of its special composition it is also suitable for intimate hygiene. It is a product very well tolerated by the skin thanks to contained in it herbal extracts. Product has moisturizing, soothing, regenerating and protecting properties. Triclosan provides antimicrobial effect. triclosan: provides antimicrobial and anti-inflammatory effect. 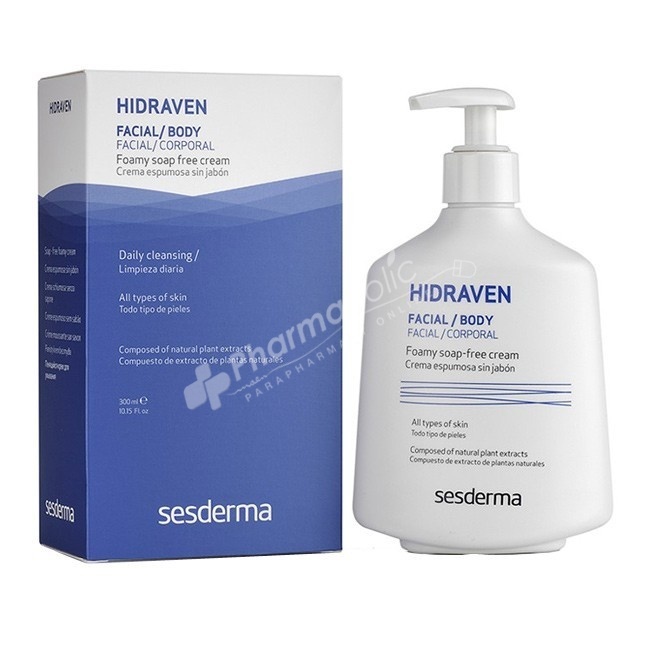 Apply Sesderma Hidraven Cream on damp skin, gently massage until foaming, then rinse with water. It can be used several times a day depending on your needs. Aqua (Water), Propylene Glycol, Sodium Laureth Sulphate, CocamidoPropyl Betaine, Cocamide Dea, , Chamomile Recutita (Matricaria extract) Mimosa Tenuiflora Bark Extract,Laureth-2,Oat (Avena Sativa) Extract, PEG-7 Glyceryl Cocoate, Aloe BarbadensisLeaf Juice ,Glycereth-90 Isostearate, Triclosan , Phenoxyethanol, Methylparaben, Propylparaben, Ethylparaben, Butylparaben.Alpha-Isomethyl Ionona, Parfum (Fragrance).